The Yellowstone River Retreat (YRR) is a clean and cozy home sitting on 25 acres in the Paradise Valley on the banks of the Yellowstone River. The trees and brush along the river provide a bird and animal sanctuary right out the front window! The full cathedral window front view faces south towards Yellowstone National Park while the side view opens up to the Gallatin Mountain Range. Trails down to the river provide privacy and excellent Blue Ribbon fishing opportunities right out the front door! In the summer months the lower water levels provide a trout pond where osprey and bald eagles have been seen snatching trout for dinner. During the winter months herds of elk can be watched from the front windows. Mule deer meander around the home year-round. 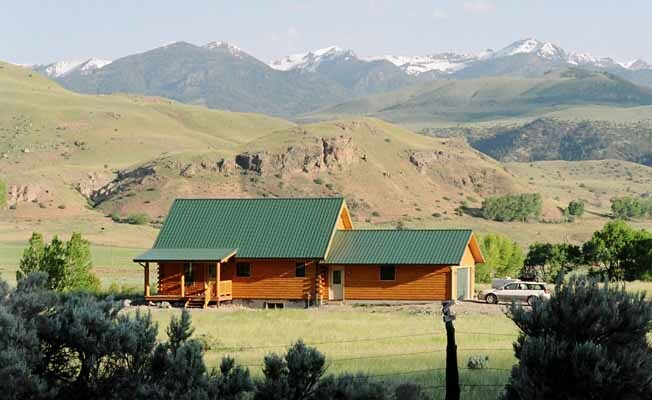 This home is only 20 minutes from the north entrance of Yellowstone National Park for your daily visits to the park. Chico Hot Springs is ten minutes away for a relaxing soak in the pool. If you need to go shopping, dine out, or visit a museum, Livingston is only a 30-minute drive away. The Yellowstone River Retreat will comfortably sleep eight guests with two queen beds, one full bed, and two twin beds in three bedrooms and a loft. The cathedral ceiling great room and kitchen provide a setting where everyone can play cards and board games while dinner is cooking. A double-car garage with a large turnaround driveway makes this home accessible and convenient. YRR is in the Paradise Valley which extends from the Yellowstone gateway community of Gardiner at the south end to historic Livingston on the north end. Appropriately named, this region is a paradise to Montana and to the Rocky Mountains. Bounded by the majestic Absaroka-Beartooth Mountains on the east, the Gallatin Range on the west, the valley follows the meandering waters of the Yellowstone River. The Yellowstone River is the longest river (free-flowing) in the 48 contiguous states without a dam. The Paradise Valley is home to some of the state's finest "blue-ribbon" fisheries. If stalking free-rising rainbows in crystal clear spring creeks while casting hoppers and salmon-flies sounds good to you, then you should visit the area and fish the Yellowstone River and world class Spring Creeks. This premier Montana vacation spot has perfect summers and mild winters in the "Big Sky" country. The close proximity to Yellowstone Park, the Beartooth Highway and many other natural wonders make it the perfect place to vacation. Anglers from around the world travel to Paradise Valley to fish its pristine waters. Whitewater rafting, kayaking, wildlife viewing and photography, hiking, camping and horseback riding are just a few of the unlimited recreational opportunities available in the area. Enjoy the exceptional beauty of Paradise Valley at the Yellowstone River Retreat! Call for reservation (406) 531-1567.